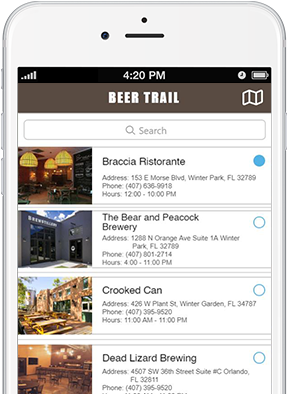 Provide craft beer enthusiasts the details they need to explore your beer trails so they can make the most of their visit. 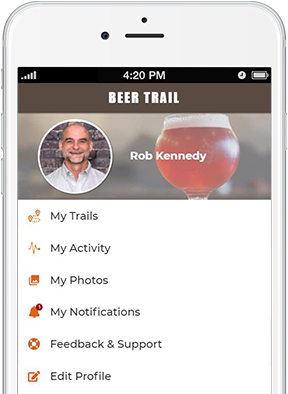 Our apps include a list of participating brewers, information on each location, featured deals, and best of all, a loyalty program to encourage users to visit all the locations featured on the trail. Users can share their check-ins at each location in the apps activity feed to let other app users see what a fantastic time they had as they earn points for each passport stamp. 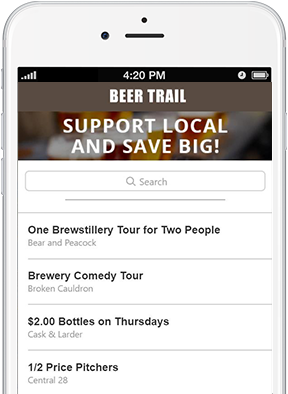 Brewer listings managed by participating brewers will all appear in the beer trail app. Each brewer location can be “clicked” to display the full-page listing of that location. Details include images, description, directions, deals, hours and social media feeds. 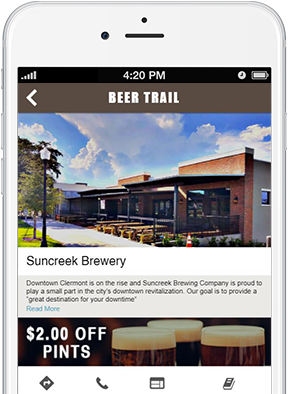 Checkout Our Beer Trail Plugin Site! Everybody loves a deal! Participating locations can include deals to encourage visits to their location. It’s also a great place to have area businesses advertise their goods and services. Another great way to generate revenue is to encourage local businesses to invest in your app by becoming sponsors. Native advertising graphics can be placed among page content. Banner Ads are another good way to get noticed. Sponsors can display their custom graphics with their logo across app pages. Banners rotate so users don’t get bored seeing the same ads. Using your customer profile you can keep track of the beers you liked during the event with items, such as, my beers, my breweries and wish list. You can save this list if you are trying new styles and breweries so you can remember for future opportunities, as well as sharing the experience with your social media audience and friends. As users visit each location, they can earn stamps in their passport. Stamps are validated by GPS. 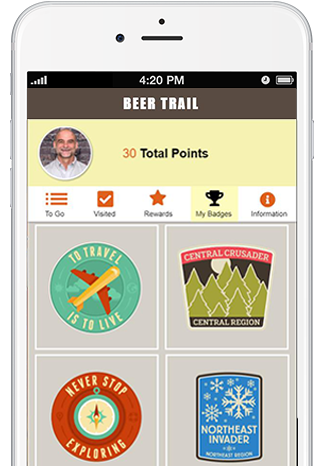 Users can claim rewards as they earn points along the trail. Our app can be set up with low-cost rewards like badges or cool swag like t-shirts and hats. Users can share with their friends through social media where they are, what they are drinking and what an awesome time they are having. Brewers Marketing creates apps that help connect brewers and their customers on a level never before possible. Contact us to learn more about how we can help you expand your brewery’s digital marketing effort and online presence.